Poor lunch - it's the meal that usually gets shafted the most. It's the meal many people eat sitting at their desks, in their cars, or hunched over a kitchen island, trying to shove in as many bites as they can before they're asked to slice more apple or get more turkey for the kids (that last one would be me). My lunches have traditionally been bland or unhealthy or both: a turkey sandwich with mustard on whole wheat bread (blah); Chik Fila chicken nuggets (man are those good! ); or some greek yogurt (a healthy choice but doesn't fill me up for very long). Usually I end up snacking on random bites of random foods for the better part of the afternoon until I'm finally full. This not only gets tiring, but I ultimately end up reaching for some sort of unhealthy snack because I've run out of other options. Lately I've been trying to put more effort into lunch. It can be a hassle on days we're running from one place to the next, but I feel so much better when I've eaten a meal instead of various handfuls of this and that. One thing I've begun making with some regularity is a caprese salad. All it consists of is a slice (or two or three) of tomato, topped with a slice of fresh mozzarella (the kind that comes floating in water), topped with a big slice of basil. I drizzle mine with my favorite balsamic vinaigrette. You can also just use olive oil & balsamic vinegar. And sometimes if I am needing some extra greens, I put a bed of baby lettuce underneath in order to make it more substantial. It's so simple to assemble; it's impossible to mess up; and it can be ready in 30 seconds. It brings a little gourmet, restaurant flair to that under-appreciated mid-day meal. Lyss, I am inspired by your blog already! I am sitting at Panera eating a chocolate croissant (naughty!) A little boy, about 6 years old, and his dad came in after school. The little boy had a bowl of soup and an apple and was SO happy. I can't wait until I have a real fully-stocked kitchen again (8 days!) and a fresh market nearby. Then I can try all your stuff for myself. 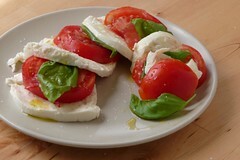 I love a good caprese salad, especially when the buffalo mozzarella is high quality. Have you tried it on a sandwich? Ciabatta or another super-crusty bread with balsamic and a little pesto... yummm. Oh yes - I forgot the sandwich part. I usually make it into a panini (my new panini maker is my best friend) with a little pesto mayo. SO good. Now I'm hungry.